Two and a half years after the earthquake and tsunami devastated northern Japan, the crippled nuclear plant in Fukushima has remained a danger to the environment as the plant’s water runs downhill into the ocean. NBC’s Anne Thompson reports. >>> we're back tonight with the urgent situation developing in japan. 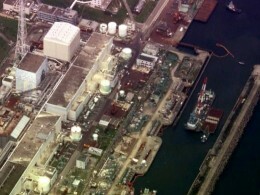 frightening new discovery at the fukushima nuclear plant two and a half years after the disaster there. we learn this week that the plant continues to leak radioactive water and it's going right into the sea. we asked our chief environmental affairs correspondent, ann thompson, to look at the risks. >> today the owners of the crippled fukushima nuclear power plant started pumping contaminated water into temporary storage tanks , a desperate act that in the minds of many is a monument to mismanagement. >> it's leaking like a sieve and groundwater is flushing radioactive contaminants into the groundwater. >> two and a half years after the earthquake and tsunami devastated northern japan, this plant is still an active danger to the environment. in part because water runs downhill. runoff from the mountains goes into the plant and soaks up radiation from leaking storage pools and poison ground. each day, for 882 days, nearly 72,000 gallons of polluted water has flowed into the pacific ocean . enough to fill an olympic-sized swimming pool every nine days. set up with the power company this week the japanese government said it's stepping in to help. calling this an urgent situation. in this country, while we have seen all kinds of tsunami debris litter america's west coast , scientists say the leak poses little danger to the u.s. because the radiation dissipates in water. and in the words of one, there's a massive ocean between us . the real risk is at fukushima . the meltdown of three nuclear reactors turned nearby towns into still lives . the threat now is offshore to japanese seafood. fishing is a $14 billion industry. this doctor of the woods hole oceanographic institute says he's finding high levels of radiation in fish like flounder are high. >> they must be sustained by a small but continued reek from the reactor site. >> today most of the fukushima fishery remains closed. now there are reports the power company is considering freezing the ground around the plant. essentially building a mile-long ice wall underground. something that's never been tried before to keep the water out. one scientist i spoke to dismissed this idea as grasping at straws, who evidence that the power company failed to anticipate this problem, lester and now cannot solve it. >> disturbing is an understatement. ann, thank you.